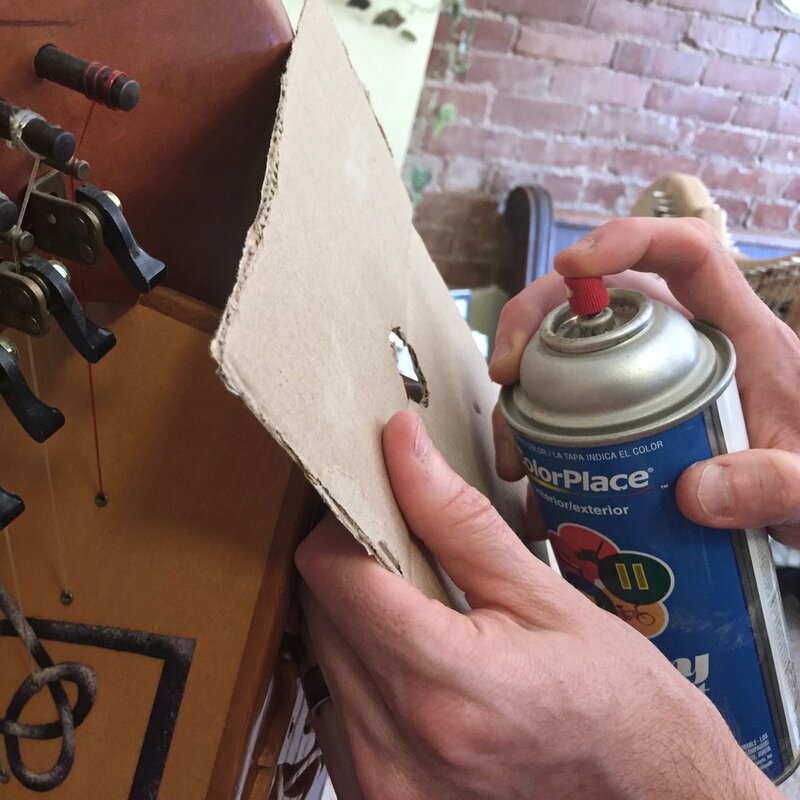 Lever Harp Finish Repair — Rees Harps Inc.
Making a minor lever harp finish repair. It’s like getting the first dent on your new car. You feel terrible. Your pristine harp no longer has that new harp glow. We’ve all been there and it’s tough but what’s done is done and it is up to you to find a way to go on. You have two choices. Most people will just live with the dent because more are bound to come in the future. However, if you decide you want to fix the intruder, the following repair process will do the trick. 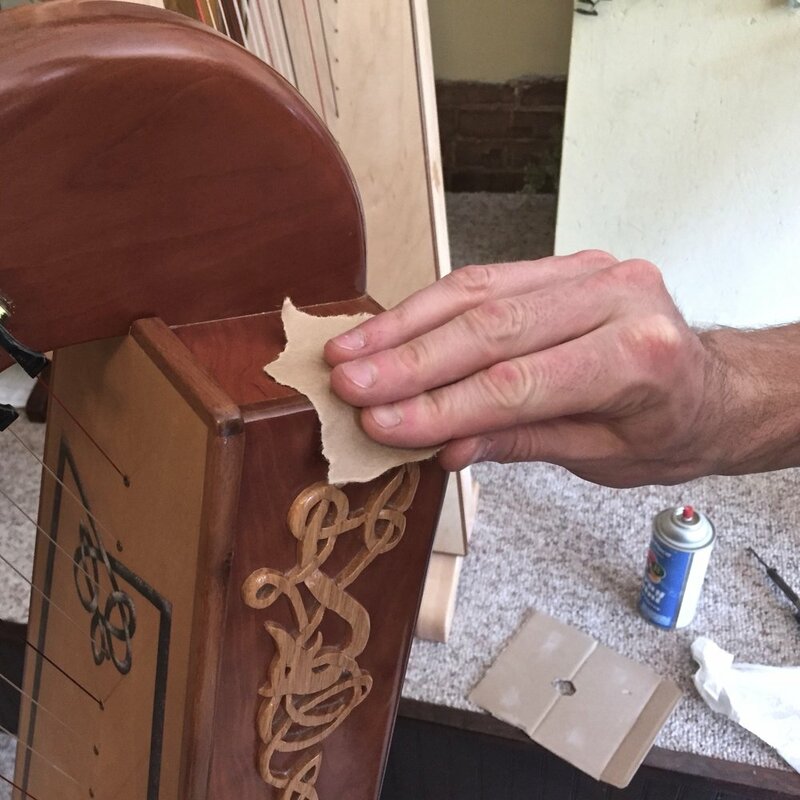 We should say, this is a process which is best done by a professional with instrument repair experience but if you are feeling intrepid.... Be aware though, if wood has been removed, by a gouge or a splinter, and you are intent on having the harp repaired, the process is entirely different and the work must be done by a professional luthier with specialized finish repair experience. Wood is made up of millions of cells, like tiny rooms. When an object strikes these cells they collapse causing the dent. What you will be doing is working to get the smashed cells inflated again so that the dented wood comes back up to, or nearly so, to the original surface level. This is done by injecting steam into the cells. The pressure of the steam will push out against the cell walls recreating the little rooms and raising the dent. Important note - do not try to sand a dent out. This will leave you with a sanded depression and the removal of the finish around the dent, creating a much bigger and more noticeable problem. You will need a cotton rag, a small bowl of water, a soldering gun or hair flattening iron (not a curling iron), 400 grit sandpaper, a spray can of semi-gloss lacquer, a piece of cardboard substantially larger than the area you are planning to repair and a brown paper bag. Steam up the dent, here using a soldering gun and a damp paper towel. Repeat the process several times. Take the cotton rag and dip the corner of it in water so that it is soaked. You want the cloth to be wet but not dripping. Lay it over the dent folded a few times so that the wood will not be burned. Then take a heated soldering gun or hair flattening iron, which has been turned up to high, and press it on the wet cloth directly over the dent for just a couple of seconds. (A standard iron or hair curling iron are generally not hot enough.) You will hear a sizzling sound as the water turns to steam and is forced into the cells. Do this a couple of times and then remove the cloth and check the dent. While the wet cloth is sizzling it will not burn the wood, only after the sizzling stops is there a chance of burning. Sometimes one or two applications will be sufficient to raise the dent. It is not uncommon, however, to have to repeat the process five or ten times. Eventually, the dent will come up at least partially. Once the dent is up as far as it will go you may sand the dent lightly with 400 grit sandpaper. Sand only the dent area touching as little of the original finish as possible. When you are done wipe the area clean with a cloth. Hold the cardboard just a bit above the area to be repaired. Be sure the hole in the cardboard has an uneven edge. Spray on sever very, very light coats. To retouch the finish over the dent you will use the spray-on semi-gloss lacquer. First take the cardboard and tear a hole that is just a tiny bit larger than the area you are repairing. Be sure to tear the edges and not cut them. This will help to prevent a hard edge between the old finish and the new finish. 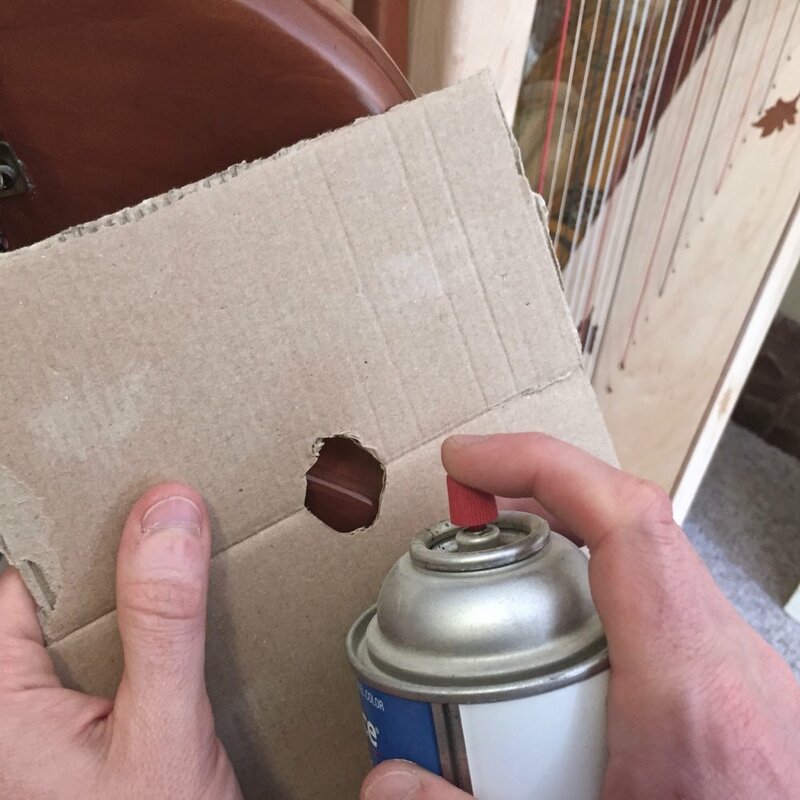 If you can, have a friend hold the cardboard a couple of inches away from the harp but lined-up with the area to be sprayed. Do not put the cardboard directly on your harp or, again, you will get a hard edge. Spray lightly and quickly. You will need to spray several coats. Do not just spray one or two heavier coats. You will regret the result. Read the lacquer can to get the specific time you must allow between coats. This is not a random number, it is chemistry and has to do with how successfully the molecules will bond between coats. It is important that you follow the directions exactly. Once you have three to five coats and you are happy with the result let the whole thing cure overnight. Once the finish is completely dry use a piece of brown paper bag to dull down the new finish section and help it blend in with the old finish. After the newly refinished area is completely dry you may find that the new finish is shinier than the finish on the rest of your harp. If so, you can dull the new finish by tearing off a piece of the brown paper bag and rubbing the new finish lightly just a few times. This also helps to blend new and old finish together at the feathered edges of the repaired area. Now you are all set...until the next dent.